February 8, 2018 by Ecommerce News. About Offline store, Statistics with tags Austria. 4395 views. The top 10 of biggest retail companies in Austria consists solely of companies that also sell products through physical stores. 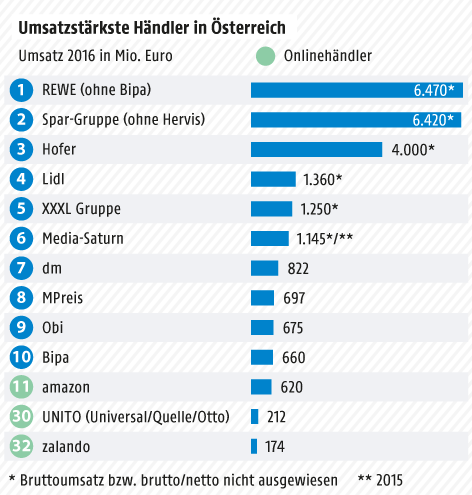 The first pure play e-retailer in Austria’s retail top 100 is Amazon, which ranks eleventh. The 100 biggest retail companies in Austria generate over half (56 percent) of total retail sales in this Central-European country. Together, these retailers have generated sales worth about 36 million euros in 2016, data from KSV1870 and EHI shows. And to further emphasize the market share of the biggest retailers: the top ten accounts for over a third of the total retail volume in Austria. At the top of the list, REWE and Spar are in a head-to-head race, each with almost 6.5 billion euros. They are followed by Hofer and Lidl, which ended respectively in third and fourth place. The top 10 of retailers in Austria. As you can see from this graph above, the first online retailer is Amazon, which generated a turnover of 620 million euros in 2016. The next pure play online retailer can be found on a 32nd place, with Zalando having generated 174 million euros in sales. The ecommerce industry lurks around the top ten, but the stationary retail isn’t sleeping”, Rainer Will, CEO at EHI, says. About three out of four retailers (78 percent) in the top 100 have their own online stores. Companies that don’t sell their goods online, are mostly food or clothing retailers in the discount area, such as Lidl or Kik.